German Shepherd Dog Forums > The Puppy Place > Development & Socialization > When is a German Shepherd physically/mentally mature? My GSD just turned 2, and still acts like a human toddler. Most dogs I've had, have matured around 3 years old both physically and mentally. 2 feels like an awkward teenager stage. Trust me, I did not just pick him out of all the breeds and just now started complaining because he's too much work. My husband has grown up with many dogs, and he was working part-time and going to school part-time, so we decided that we could get a German Shepherd. I did hear from an experienced GSD owner that they go through their "teenage" phase around 8 to 18 months, when they get extremely stubborn and do things that drive you crazy. Unfortunately, that's also the time frame that my husband has to leave, which we did not know about until a month after we brought our puppy home. I'm really trying to hang on and train him a little each day and wait until his human papa comes home. 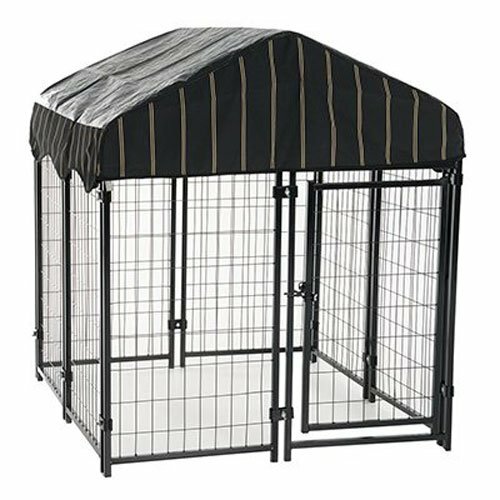 Do you have a utility /mudroom the dog can be confined in until(it will happen) he is better at staying lose in the house? All my dogs were allowed to roam after one year but not my new puppy (who is now one) will not be allowed lose anytime soon by himself in the house. Pup goes into his extra large crate when I leave or he will go out into the kennel, weather permitting. Also since I do live on a large track of land, I was told by both my fire and police departments, who know the farms around here to keep the pet's crate covered and right next to the door in case of fire , they WILL NOT GO INTO A BURNING HOUSE risking their lives looking for a scared pet-(yep strait from their mouths) but they will pull the whole crate out or at least open the crate's door to let pup out of the house since it is right next to the door, under the window with the reflective pet here sticker. Last edited by dojoson41; 03-13-2019 at 05:47 AM. We use something like this for Jack when we had/have to contain him. He can stand up all the way, turn around, and it'll fit his dog bed. If he's tearing up things, for his own safety, I would crate him. My female is 18 months and she is still crated whereas my shiba was allowed to roam free in the house at 8 months with no issues. He got into my medication at 5 months (my husband would take him out of the crate when I left for work) - let me tell you, that is no fun. Every dog is different. Yeah, you can feel bad, but honestly, how much different is it from being stuck in the house? Mine just sleep all day anyways. They can't go potty if you don't leave the back door open(unless you have a doggy door). For those sad puppy dog eyes, get him a frozen stuffed Kong or something similar to keep him occupied as you step out the door. By the time he's finished he'll notice you're gone and just settle down for the day. I like dogfaeries's set up, but mine would go over that gate in a heartbeat. It might work for OP, though. Leerburg.com is a wealth of free info. My Dutch Shepherd wasn't allowed loose in the house until she was over 4. Gunny,my 20 month old GSD has run of my art room. But he does get into things if I have not done enough mental and physical work with him. Mental exercise is as important if not more important for working breeds. Start them young and they actually "learn to learn".